After kiting for a while decided I wanted to kite in the surf but found my little Naish stubbie 115 was nosing down in short chop or waves. 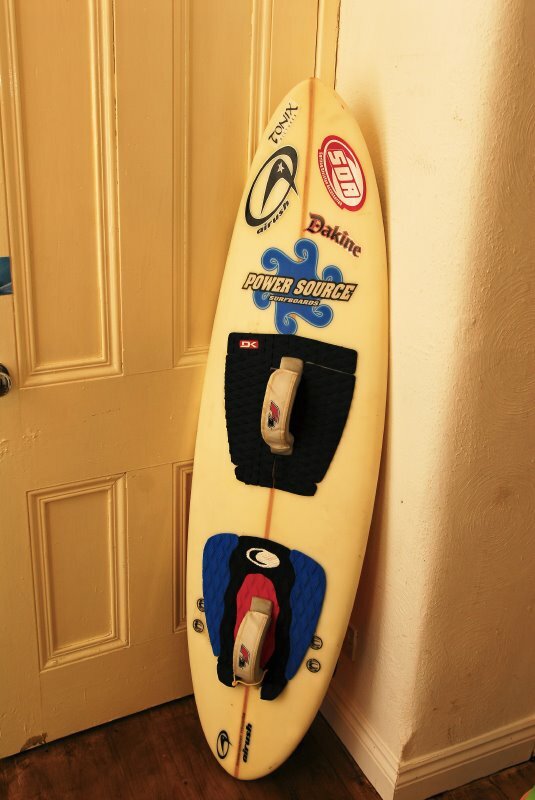 After a little session with a 5 foot surfboard belonging to Stuart of Windthings Edinburgh ordered a Powersource custom from Ireland. Good in many ways and having fun on the board. There is also the element of fins – this board has fcs fins so the fins can be changed – but these fins are similar to a conventional surfboard in that they are toed in quite severely to help with rail to rail transitions. But being pulled along with a kite makes board speed higher than surfing and the board is often canted as you oppose force of kite. Fins can cavitate and actually cause instability in tracking. A much better argument is laid out in this forum …. Also i felt that the centre of effort was behind my rear leg – or my foot to far in front of fins so when reaching or trying to go upwind the board was always pushing to go further onto reach. Tried changing fins and using different combo. ;”> There is an argument to say “don’t use the rail – let the fins do the work” but it still wouldn’t go upwind brilliantly. ;”> ;”>In waves this board was really only good in pretty much perfect cross shore wind – and then it was very good – going;”> powered up and really slamming the waves. Tail slid out lovely with a lot of spray – but in cross-onshore and onshore it wasn’t fab (or maybe my riding isn’t good enough) so I always went back to twintip. ;”> ;”>Since reading the forum I felt that a quad board might be the way forward – also one that is bigger to allow more float and less dependence on the kite. Ordered a quad from Dereck Camacho from Florida. It’s a more fish shape – It is a 6 foot swallow tail board with a snubbed down nose so about 5’8″ in length – width is 18.25 and there is a concave running down the middle. Rails more parallel partly helped by that swallow tail so will allow better edging when kiting (where rail is canted over) and 4 more parallel fins will stop the fin cavitation that the shorter 5′ foot thruster suffers from. Getting shaped now so can’t say yet how it will be but can’t wait to try it out. Will let you know how glassing and delivery went. Including Fedex delivery to UK works out to £402 which when you consider other production boards are around the £500 mark it seems like a good deal.